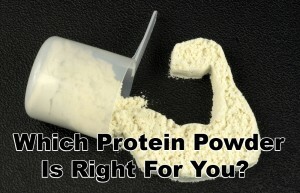 Posted on December 3, 2013 | Comments Off on Which Protein Powder Is Right For You? Protein powders have long been popular with body builders and athletes but can the average active person benefit as well? As a major component of our diet, protein fuels energy and serves as the basis for health, repair and replenishment. How much protein the body requires and what kind of protein best meets individual needs has long been a subject for debate. We do know, however, that adequate daily protein recommendations depend largely on age and activity level and that people who exercise regularly require more energy. For example, a pregnant woman, a growing child, or an athlete who trains intensely will all require more protein than an adult in their senior years. For the general population, approximately 20 – 30% of your total caloric intake should come from protein sources. Protein clocks in at 4 calories per gram, and like all foods, if you eat more than you burn you will gain weight from eating protein in excess. It’s important to remember that to obtain optimal health and weight, you need to eat a good balance of healthy fats, carbs and protein. You are a teenager who is working out. Teenagers who are still growing need more protein in general and may need extra protein to fuel workouts. You are a newbie to exercise. If you haven’t worked out before and are trying to build muscle, you will require additional protein. You want to amp it up. If you are a regular exerciser who now wants to train for a marathon, you will need additional protein. You are in recovery from an injury. Anyone who is injured or has had surgery as well as athletes with sports injuries may need more protein to aid healing. You have decided to go vegan. People new to vegan or vegetarian diets who are eliminating animal protein, dairy or eggs, need a new source of protein in their diets. Protein powders can fill that void. 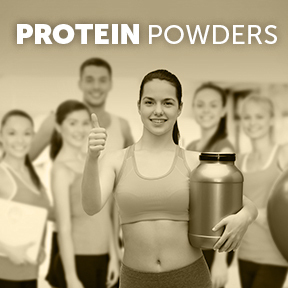 Protein powders are an easy and convenient way to add more protein to your diet. Individuals who combine a slightly higher protein intake with exercise have more lean muscle tissue and less body fat. Complete high-quality proteins contain the 9 essential amino acids that the body cannot manufacture and must obtain from foods. Personal needs and dietary preferences will help determine which protein powder is right for you. You can alternate between a dairy based or a plant based protein powder if you are aiming for overall health. Whey Protein Concentrate – Low in both fat and cholesterol, whey protein is quickly broken down and absorbed into the bloodstream, which makes it a good choice to consume after a workout. Whey is a complete protein made from cow’s milk so it is not suitable for those with lactose intolerance or milk allergy. Whey Protein Isolate – Processed to remove the fat and lactose, whey protein isolate is the purest and most concentrated form of whey protein. On a gram-to-gram basis, whey protein isolate delivers more amino acids without the fat or cholesterol. Calcium Caseinate – Derived from skim milk, casein is a slow release protein, making it a good choice for meal replacement or to take before bed. High in amino acids and low in fat and carbs, calcium caseinate releases helpful muscle-building amino acids over a longer period of time as compared to other protein powders. Soy Protein – This highly digestible form of vegetable protein is a great alternative for those who want to avoid animal and dairy protein. Soy protein is a complete protein and provides all the essential amino acids for nutrition. Soy protein is generally highly processed and may be genetically modified so look for non-GMO sources and consume in moderation. Pea Protein – Hypoallergenic and highly absorbable, pea protein contains essential and nonessential amino acids. Pea protein is a good choice for sports and performance recovery, as its branched chain amino acid protein compounds have been shown to delay fatigue during exercise. This is a high protein option for vegans and vegetarians or anyone who leans toward a plant-based diet. Brown Rice Protein – Plant-based and largely carbohydrate, brown rice protein needs to be paired with pea or hemp protein to compete the amino acid profile. However, it’s considered hypoallergenic and is a good choice for those with allergies to soy, wheat or dairy. Hemp Protein – The high fiber content of this near complete plant-based protein may be helpful in weight loss. Like other plant-based proteins, hemp is easily digestible and may help reduce muscle soreness, making it a good choice for active people. New Zealand High Protein Whey Powder – 92% by Vital Nutrients – With 23 grams of protein per serving, this naturally flavored and minimally processed whey protein isolate is harvested from milk produced in New Zealand by cows that graze on chemical and pesticide free pastures. Free of antibiotics and growth hormones, this product contains naturally occurring immunoglobulins that help support and maintain a healthy immune system. Ultra Protein Plus by Douglas Laboratories – This low allergen, nutritionally fortified product contains 18 grams of non-GMO sourced yellow pea protein per serving plus essential nutrients, vitamins, minerals and prebiotics. Pesticide, lactose, gluten free. Klean Isolate by Klean Athlete – Free of flavorings, sweeteners, and artificial ingredients, this product contains 20 grams of pure whey protein isolate per serving for enhanced protein and amino acid intake. Low Carb Protein by Metabolic Response Modifier – Sustained release blend of whey protein concentrate and calcium caseinate with 22 grams of protein and 2 grams of carbs per serving. Comments Off on Which Protein Powder Is Right For You?